A total of 213 operators have commercially launched LTE services in 81 countries, an increase of 113 networks in the past 12 months, according to Global mobile Suppliers Association (GSA), which now forecasts there will be 260 commercial LTE networks in 93 countries by end 2013. 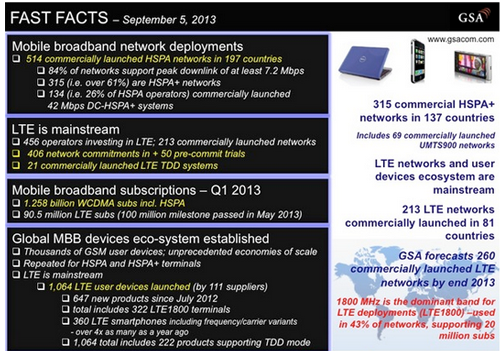 456 operators are investing in LTE in 134 countries. This is made up of 406 firm operator commitments to build LTE networks, 213 have commercially launched networks in 81 countries plus 50 additional operators engaged in various trials, studies, etc. 1,064 LTE user devices have been announced by 111 manufacturers, representing around 150% annual growth. The majority of LTE operators have deployed the FDD mode of the standard. The most widely used band in network deployments continues to be 1800 MHz (band 3) which is used in 43% of commercially launched LTE networks. The next most popular contiguous bands are 2.6 GHz (band 7) used in over 31% of networks, followed by 800 MHz band 20 (over 11%). 21 LTE TDD systems are commercially launched (within the total LTE launch count of 213) and 10 of them have been deployed within combined LTE FDD and TDD networks, which is a growing trend. GSA reported last month that 222 user devices support the TDD mode. There are almost 30 operators who have launched, or are planning enhancements to their networks including support for Category 4, multicarrier operation, and LTE-Advanced features such as carrier aggregation. Alan Hadden, President of the GSA, stated: For the first time operators are reporting that they are selling more smartphones than any other device type. Our research confirmed that smartphones are the largest device category for LTE users. Operators need to invest to keep delivering the best mobile broadband experience, and compete. 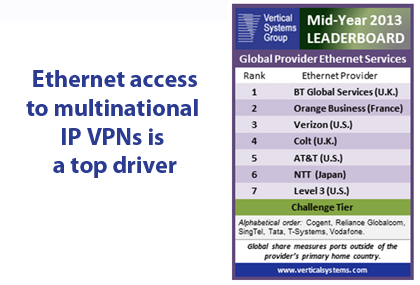 Vertical Systems published its Mid-2013 Global Provider Ethernet Leaderboard, the industry's benchmark for measuring multinational Ethernet network market presence. Global Providers ranked on the Leaderboard hold four percent (4%) or more of retail business Ethernet installations based on billable ports at sites outside of their respective home countries. The following seven companies were listed: BT Global Services (U.K.), Orange Business (France), Verizon (U.S.), Colt (U.K.), AT&T (U.S.), NTT (Japan) and Level 3 (U.S.). "The migration of legacy access to Ethernet is in full swing across all regional markets throughout the world," said Rick Malone, principal at Vertical Systems Group. "Providers cited Ethernet access for multinational IP VPNs as the top driver for port growth during this research cycle. BT has taken advantage of this opportunity within its extensive base of global VPNs to attain the top position on our Global Provider Leaderboard." Other Global Providers offering Ethernet services outside of their home countries have port shares that are below the Leaderboard threshold. These companies are segmented by share into two tiers: the Challenge tier and the Market Player tier. The Challenge tier companies as of mid-2013 are the following (Note - in alphabetical order): Cogent (U.S.), Reliance Globalcom (India), SingTel (Singapore), Tata Communications (India), T-Systems (Germany) and Vodafone (U.K.). Vodafone achieved a Challenge tier position based on its acquisition of Cable & Wireless Worldwide. The Market Player tier encompasses all other providers selling retail Ethernet services outside their home countries. Providers in the Market Player tier include the following companies (Note - in alphabetical order): Airtel (India), Bell Canada (Canada), Bezeq (Israel), CAT Telecom (Thailand), CenturyLink (U.S.), China Telecom (China), China Unicom (China), Chunghwa Telecom (Taiwan), Easynet Global Services (U.K.), Eircom (Ireland), Embratel (Brazil), euNetworks (U.K.), Exponential-e (U.K.), Globe (Phillipines), GlobeNet (Brazil), GTS (Poland), GTT (U.S.), Indosat (Indonesia), Interoute (U.K.), KDDI (Japan), Korea Telecom (Korea), KPN International (Netherlands), Masergy (U.S.), O2 (Czech Republic), PCCW Global (Hong Kong), PLDT (Phillipines), Rostelecom (Russia), Softbank Telecom (Japan), StarHub (Singapore), Swisscom (Switzerland), TDC (Denmark), Telecom Italia International (Italy), Telecom New Zealand (New Zealand), Telefonica Worldwide (Spain), Telenor (Norway), TeliaSonera (Sweden), Telkom Indonesia (Indonesia), Telkom South Africa (South Africa), TelMex (Mexico), Telstra (Australia), Telus International (Canada), Time (Malaysia), TM (Malaysia), Vector (New Zealand), Virgin Media Business (U.K.), Zayo Group (U.S.) and others. Market shares are calculated using the base of enterprise Ethernet services installations, plus input from Vertical's surveys of Ethernet providers throughout the world. 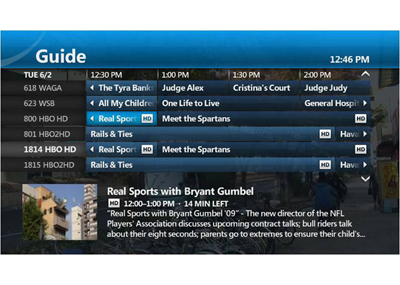 Ericsson completed its previously announced acquisition of Microsoft's Mediaroom business and TV solution. The deal, which was first announced in April 2013, makes Ericsson the world's largest, by market share, and the most experienced provider of IPTV middleware technology and solutions. The Mediaroom IPTV platform holds about a 25% share of the global IPTV market. Mediaroom-powered TV services are offered by nearly 60 of the world's leading operators, delivering services to almost 13 million households, and close to 24 million set top boxes, throughout the world. Customers include AT&T U-verse, Entertain of Deutsche Telekom, Telefonica, TELUS Optik TV and Swisscom. Per Borgklint, Senior Vice President and Head of Business Unit Support Solutions at Ericsson said: "This acquisition places us even more securely at the heart of an exciting and highly innovative industry. IPTV subscribers alone are predicted to grow by more than 18% each year to reach 105 million subscribers and revenue of USD 45 b. by 2015. By incorporating Mediaroom into our broad portfolio of solutions we will ensure our customers have the ultimate partner as they transform towards true TV Anywhere multi-screen services and optimized video delivery in any network"
Mediaroom is based in Mountain View, California, and is comprised of more than 400 people worldwide. The former Mediaroom business unit, including staff, will be integrated into the Ericsson group under the Business Unit Support Solutions, and will be called Ericsson Mediaroom . NSN confirmed that is supported the world’s first operators to launch LTE-Advanced commercially: SK Telecom, LG U+ and Korea Telecom . The operators have implemented LTE-Advanced carrier aggregation with a software upgrade for Nokia Solutions and Network’s Flexi Multiradio Base Stations. LTE-Advanced carrier aggregation enables the operators to reach up to 150 Mbps throughput by dynamically combining the resources of the two LTE frequency bands. The carrier aggregation feature doubles the data rates compared to those before the upgrade. UAE-IX, the Dubai-based Internet exchange that opened one year ago, now serves more than 20 networks from the Middle East. Customers include leading global players and providers from the UAE, Saudi Arabia, Qatar, Kuwait and Turkey. Recent new peers include STC and Vodafone Qatar, further increasing the reach of the exchange. UAE-IX’s customer base now reaches 55% of all eyeballs in the GCC markets. This makes UAE-IX the partner of choice for a wide variety of providers, including access networks, cloud computing players, hosters and content delivery networks (CDNs). UAE-IX, which is fully operated by DE-CIX, was the first carrier-neutral Internet exchange for the Middle East and is built on a fully redundant switching platform. ADVA Optical Networking announced a significant milestone: Openreach, the infrastructure division of BT Group, has deployed over 100,000 FSP 150 circuits into its Ethernet Access Direct (EAD) services. Since its public launch in 2009, EAD services have been widely adopted by enterprises throughout the U.K.
“Openreach is a company that's working hard to meet and exceed its customers' expectations” commented Sarah Mendham, account director, ADVA Optical Networking. “Together we've helped to drive Ethernet connectivity across the U.K., and we believe a major cornerstone for this achievement is our FSP Management Suite." Telefónica has named Alcatel-Lucent as a reference supplier for its 4G LTE network in Spain. Alcatel-Lucent said this award represents the largest LTE deployment in Western Europe so far. Tele2 Netherlands selected Nokia Solutions and Networks to supply a nationwide greenfield radio access network and related services to enable new 4G services. Tele2 Netherlands holds licenses for the 2600 MHz and 800 MHz frequency bands. NSN will provide its Single RAN advanced platform, which is based on its Flexi Multiradio 10 Base Station. As well as providing the NSN Radio Access security solution for authentication and data protection, the company will also implement the NetAct network management system to enable consolidated configuration, monitoring and optimization of the operator’s LTE network. Financial terms were not disclosed. "With the ever increasing demand to deliver high-bandwidth data services any time, anywhere, operators need to evolve their networks to adopt new technologies like LTE,” said Peter Wennerstrom, head of Tele2 global account team at NSN. “We are pleased to be entrusted with this project to help Tele2 build a highly innovative 4G network."